Chris received his BS in Biology and his PhD in Neuroscience. He did his graduate work in Peter Smith’s lab at the University of Alberta examining how peptide transmitters regulate the expression and function of ion channels in the sympathetic autonomic system. 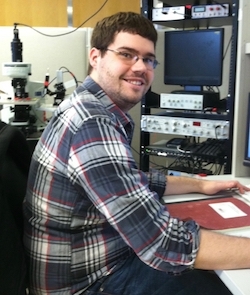 Following graduation, he moved to Portland to join John Williams’ lab at the Vollum Institute. In 2011, Chris moved to the shores of Lake Erie to start his own lab at Case Western. In the fall of 2017 the lab packed up and moved west to the slopes of the rocky mountains to join the Department of Pharmacology at UC Denver. The lab’s main focus is on the synaptic mechanisms that regulate transmission by neuromodulators. 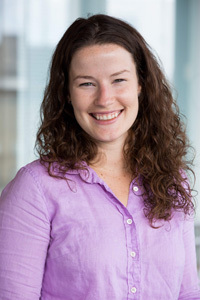 Kelsey joined the Ford Lab in April of 2018. Kelsey received her PhD in 2015 having worked with Ulli Bayer at the University of Colorado. 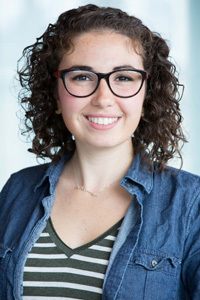 Having worked on the role of CaMKII in regulating synaptic plasticity she went to Brown University in 2015 to work with Julie Kauer on inhibitory plasticity in the VTA. Kelsey has been the recipient of a pre-doctoral NRSA and is currently supported by a postdoctoral NRSA (F32-DA43924). She is currently looking at synaptic inputs are integrated to regulate catecholamine neuron excitability and subsequent release. Andrew joined the lab March 2019. Andrew did his PhD in the Department of Physiology at the University of Auckland, NZ. His work examined the excitability of dopamine neurons in the SNc and VTA and the factors that contribute to their sensitivity to Parkinsonian toxins. Having coming half way around the world and up to the northern hemisphere, Andrew is using the combination of electrophysiology and multiphoton imaging to examine how dopamine D2-receptors in the striatum synaptically encode the release of dopamine. Yuan joined the lab in January of 2016. He graduated from Capital Medical University in China in 2014 with a Bachelors degree in Medicine. Deciding not to pursue medicine he moved to the US in 2014. After spending a year at Ohio University he moved to Case Western to join the lab in the Department of Physiology and Biophysics. Yuan is interested in understanding how substantia nigra dopamine neurons regulate the dynamics of cholinergic interneuron activity. Yuan likes doing experiments and is happy to be done with classes so he can get back to experiments. Sarah is a MD/PhD student in the UC Denver MSTP program. Formerly of the CWRU MSTP, she transferred programs as part of the lab move to join the Neuroscience graduate program. Sarah is currently looking at the connectivity of circuits in the VTA and SNc. Sheng joined the lab in 2017. After earning his bachelor’s degree from Jilin University, Sheng joined the Department of Physiology and Biophysics at Case Western Reserve University. Sheng’s current investigative work focuses on understanding how dopamine signals are encoded by D2-receptors across mesolimbic and striatonigral circuits. Mike is our lab manager. He joined the lab in spring of 2018. Mike had previously been a PRA in Physiology & Biophysics here for several years and recently was at the University of Washington in Seattle. Mike's past work has involved looking mechanisms regulating the olfactory and cholinergic systems. Cam joined the lab in spring of 2019. Cam had previously been a PRA here on campus for several years before joining our group. She takes care of our husbandry and keeps us organized. Didi did her undergraduate at Case Western and joined the lab initially as a technician for eight months before starting her PhD in Neurosciences. Didi was interested in understanding how muscarinic receptors in the striatum encode the release of ACh from cholinergic interneurons and how excitatory inputs regulate cholinergic activity and transmission in the striatum. Didi is currently doing her postdoctoral work with Anatol Kreitzer at the Gladstone Institute at UCSF. SUHANTI BANERJEE. Suhanti was our research technician in the lab at Case Western from June of 2016 until the lab moved to Denver in in 2017. She kept us organized. SANTOSH COORG. Santosh was a Case Western undergraduate who spent the summer of 2016 in the lab as summer student. She worked with Pam doing fast-scan cyclic voltammetry and is now in medical school at Rutgers. SAMANTHA SIMPSON. Samantha was an undergraduate summer student who spent two summers in 2011 and 2012 when she was at Cedarveill University. She then came back again for her research rotation during medical school at the Cleveland Clinic Learner School of Medicine. She is currently pursuing her residency.